I’m back, and I’m packin’ an Android now. Much has happened since my self-imposed hiatus from blogging. I had actually considered stopping completely for lack of time and effort. But most things you like and wish to engage in take some time and effort. I notice when I am contributing to the blogosphere my writing skills are bettered. Not only the writing, but my studying and researching skills are enhanced as well. It takes an effort to publish something truthful and right. First, I’d like to thank my spiritual brother Jacob for encouraging me to blog again. Rawk On Jacob! One thing in my life that has changed is my smart phone. I have cast off the iPhone crutches to pursue a more technologically gifted side iron. The weapon of vast reward is my new Motorola Atrix Andriod powered phone with a very powerful 1GHz Dual Core processor. AT&T brags that it is the “world’s most powerful smart phone “. I am not certain of this but it does do multi-tasking well and the HD videos fly, especially when connected to a WiFi network. One of the first apps I downloaded is the YouVersion Bible software. The app is free for Android and has 50+ reading plans for reading through the bible. I even use this app during church sometimes. Note to pastors: If you see me keying with my phone during your sermon, believe me, I am not texting John MacArthur with your scriptural insight. I am using it to follow along and maybe, just maybe, taking notes. The YouVersion app easily lets me search for related scripture within multiple bible translations. Of course my main translation staple is the ESV. I am finding that my favorite part of the app is the Bible reading plan. I am currently on Day 64 of my One Year Bible reading plan. Having the tool has helped me to be more disciplined about reading the scripture daily since I have my phone with me at all times. Color me geek. There is also a great WordPress blogging app I have downloaded for free. I may even begin to utilize that tool to help in my quest to start blogging again, and more frequently. Blog on my friend, Blog on! 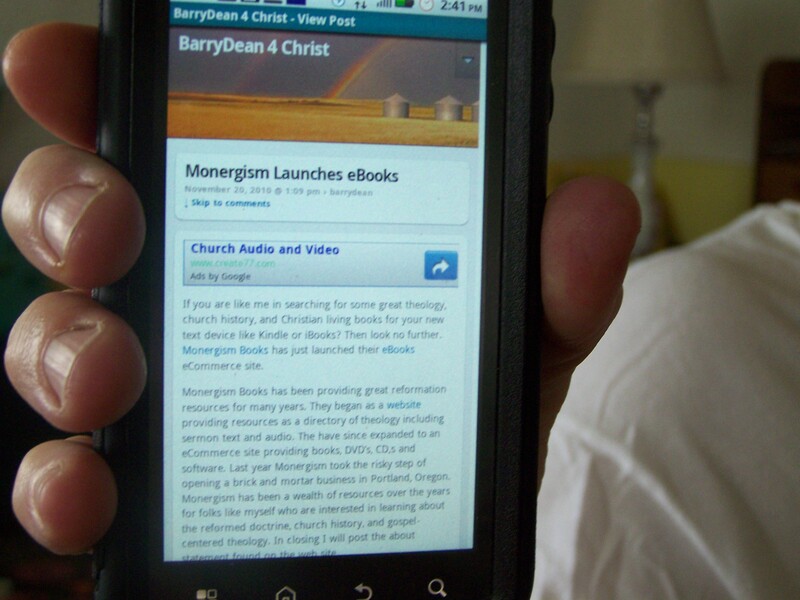 I love the WordPress app on my Motorola Droid 2, and Youversion is my all time favorite app. I absolutely love the reading plans. It’s definitely made devotional time much easier and allowed me to read anywhere. I try to dodge using it in church, though, as I also don’t want to give the illusion that I’m texting during classes or sermons. Nice post!